Definition: The Alternatives to Recruitment are the temporary ways of hiring people for the job position with a view to saving cost incurred in recruiting process and meet the short-term demand for increased work volume. The recruitment is the costly process which includes the salaries of recruiters, cost incurred in advertisements, time spent by the management, cost of hiring new recruits, etc. Thus, in order to meet the short-term fluctuations in the work volume, organizations might resort to the temporary recruitment alternatives than a full-fledged recruitment. Overtime: In case the demand for a product peaks due to the temporary market fluctuations, then a firm asks its employees to work extra despite recruiting new hands. The overtime benefits both the employee and the employer as the former fetches extra income for the additional piece of work while the latter saves cost incurred in recruiting new persons. But however, an overtime leads to fatigue, reduces the productivity of an employee and ultimately leads to more accidents and absenteeism. Employee Leasing: The employee leasing is another form of alternative to recruitment wherein the company pays a fee to the leasing firm or the consultancy that handles employee benefits, payroll, and all other HR functions on behalf of the client company. The employee leasing is also called as “staff outsourcing” wherein the permanent employees of other firms are hired due to their specialization in a certain field on a lease basis to meet the short term requirements of the client company. Here the individuals work for the leasing firm. Subcontracting: The subcontracting is a business practice wherein a certain portion of the work is delegated to other specialized agencies to meet a surge in the demand for goods and services. Here, the contractor with a mutual consent assigns some task to some other specialist contractor who helps in completing the project. The subcontracting is prevalent in the complex jobs such as construction, building, and information technology. Temporary Employment: The temporary employees are those who are hired for a specific time period until the task gets accomplished. Earlier the temporary employment agencies were used in hiring the unskilled and semi-skilled laborers, but nowadays the employees are readily available for the technical, professional and executive positions as well. The temporary employment is beneficial for the firms as the cost of labor is relatively less, services of an experienced labor can be utilized, and there is flexibility in responding to the future needs of workers. But however, temporary employment lacks labor commitment to the organizational goals since the workers hired do not know about the culture and workflow of the firm. Outsourcing: Often the companies outsource or assign the task of recruitment to the third party specialist, who then carry out all the recruitment activities which would have been done in-house otherwise. It is beneficial for the firms which are small and have a lack of expertise in recruitment to delegate the authority to the third party to carry out the recruitments on the company’s behalf. But the responsibility lies with the client company itself and must ensure that all the activities related to recruitment are performed effectively by the third party. 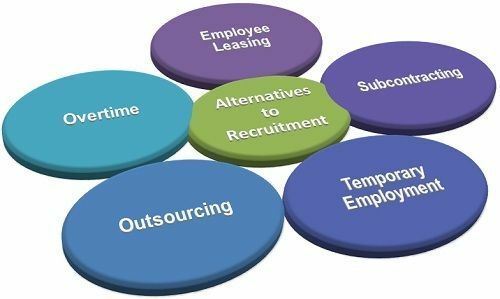 Thus, these alternatives to recruitment help any organization to employ the staff temporarily and save huge costs incurred in the recruitment process. These methods offer an opportunity to any organization to capitalize on the expertise of the employees for a specific time period if not wanted it to be permanent.